White Cabinets find a true companion: New Caledonia Granite Countertop. Friendly New Caledonia White Cabinets Backsplash Ideas is now in kitchen remodeling. The combination turns always attractive and elegant since New Caledonia Granite has a fairly uniform pattern incorporating gray, ivory, black and brown color tones. Easy to match characteristic of New Caledonia Granite countertop will be shown in my article, clear images and simple solutions will make you happy in your white cabinets backsplash selection. You will see that, New Caledonia countertop is a very good example for uniform pattern countertops while white kitchen cabinetry is picked. The writing style of mine gives you first the name and the characteristics of the backsplash, then the color and stain of the white cabinets. In New Caledonia White Cabinet Backsplash Ideas, the backsplash colors go go usually with white, light gray and light beige and blue tones. Dark gray backsplash can be chosen to make enough contrast. The interesting pictures would be seen in my previous article. Wisdom of Gray: New Caledonia Granite Countertop. The material for the backsplash can be ceramic, glass, marble, or plastic pre made backsplash panel. The type of the backsplash tile would be subway, mini subway, matchstick, 4×4 Square, and mosaic. Some countertops are very easygoing , so the kitchen remodeling is being fun. New Caledonia Granite is one the favorite of mine. I am hoping that , the picks in the pictures of New Caledonia White Cabinets Backsplash Ideas satisfies your hunger. Picture Credits: Frederick + Frederick Artitechs., The wall color is Sherwin Williams SW 6162 Ancient Marble. The floors are engineered hickory. Picture Credit: Designer’s Choice Interiors., The countertop granite is Caledonia. The cabinets were a white painted maple with an espresso glaze and were purchased through a distributer of Schlock Cabinetry ( discontinued ). the cabinets were less cream and more white, with the glaze appearing almost black. Picture Credit: Pine Streets Carpenters & Kitchen Studio., The backsplash features Sonoma Pure White Bevel 3×6 tiles. 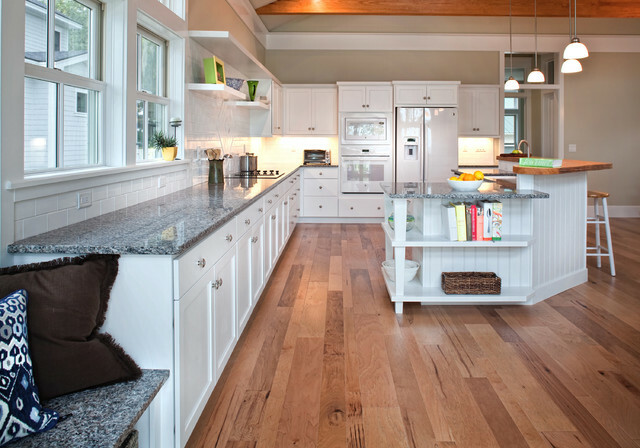 The cabinets are Brookhaven by Wood-Mode (Edgemont raised panel door in Arctic white). Picture Credit: Above & Beyond Home Concepts via Houzz., The backsplash is the Carrara random brick honed. If you drop your comments and pictures and make my blog more loveable, that would be great. I am looking forward to hearing you soon.